We offer a specialist cutting and bonding service to suit the requirements of our customers; whether it’s a small run or a run of several thousands, we’re perfectly setup to be able to assist. Our bespoke cutting and bonding service allows many different variables to be taken into account, in the manufacture of your desired components. We offer a specialist sheet cutting and bonding service to suit and are perfectly setup to be able to assist. Our bespoke cutting and bonding service allows many different variables to be taken into account, in the manufacture of your perfect desired components. We have many specialised materials available, all are available in a range of thicknesses in sheet and roll form, perfect to suit your requirements. Keeping a wide-range of rubber, foam, cork and other materials in stock, ensures that we have a suitable material for your product need; with the correct attributes and strengths. We manufacture all products to your intricate requirements - whilst providing insight, knowledge and experience throughout the process - to ensure that the end result is perfectly fit for the desired purpose. However, our bespoke sheet cutting service isn’t just limited to this range, so get in touch with us today and receive quote from one of our in-house sheet cutting experts. 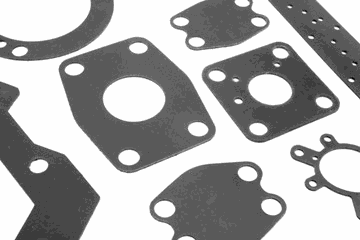 Contact us today to discuss your custom rubber cutting and bonding needs.